Looking for the real Cambodia? 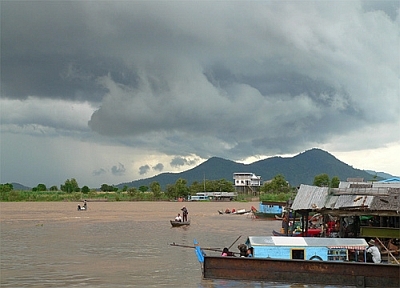 Look no further than Tonle Sap. Located directly in the center of the country, Tonle Sap is, quite literally, the lifeblood of Cambodia, helping to supply the country with their massive intake of fish (which accounts for 70% of a typical Cambodian’s diet). Incredibly, this lake will increase its size 10-fold during the monsoon season, then shrink back down just when the swimming gets good. As this article over at the Toronto Star explores, the lake receives few Western visitors, let alone visitors at all, making it an ideal spot to catch a boat, float up the Mekong and explore a little-known section of the Cambodian countryside. Most boats will stop at Chong Khneas, an incredible floating village comprised of 5000 people living in over 1300 houseboats and in a network of stilted houses to survive the flooding. New Orleans, take notice. Do you think its possible to stilt the entire French Quarter?